If it seems like we’ve done a lot of blog posts lately about conferences, you’re right! Westchester’s schedule is filled with numerous events, particularly from April to June, because we understand the importance of keeping up with developments impacting the publishing community. One of the last meeting dates on Westchester’s calendar before summer begins, was the AAUP 2017 Conference, which took place June 11-13. Bill Foley, Key Accounts Manager, Susan Baker, Director, Editorial Services, and Michael Jon Jensen, Director, Technology traveled to Austin, TX for the Association of American University Presses Annual Meeting. I asked them to share their insights with me, and all three expressed a significant amount of optimism about the current and future prospects for university presses. This was further affirmed by the presence of AAUP’s newest member, University of Cincinnati Press, the first university press to be launched in several years. PW also noted the positive atmosphere of the conference in this article about the vitality of university presses. Our team hit the ground running, with Susan and Michael attending the opening banquet, featuring a keynote address given by Dan Rather. According to Susan, Rather commented on some of the serious challenges facing the world and the nation, urging attendees not to be complacent. What followed was a pep talk praising the work of university presses and encouraging those in the room to persevere in their careers. Michael also came away feeling “quite inspired by the thoughtful words”, Dan Rather delivered to the audience at Sunday night’s event. AAUP always offers up a variety of interesting topics for attendees to learn about in each day’s sessions, and the trio made sure to be at as many as their schedules allowed. Bill sat in on the Scholarly Publishing Services and University Press session, where the panelists discussed publishing scholarly works —Ph.D. thesis’s and personal endeavors based on their field of study—as a way to provide publishing opportunities to the university community which would not normally be available. Bill observed this approach is gaining traction at a number of schools, and believes it is a great resource for the new author who wants to get published. 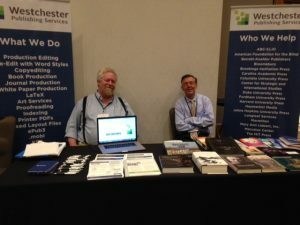 Susan attended the session previewing the next edition of the Chicago Manual of Style, which is due out in September. New ways of accessing information create the need to correctly cite electronic sources and open access materials, and Susan also noted there will be interesting, and potentially controversial changes to some long-held grammatical conventions. According to Michael, the sessions capturing his attention covered the state of “artificial intelligence” and its implications, as well as a fascinating session involving “comment” and “annotation” capabilities on public documents, using tools like Hypothes.is and others. Whether for classroom use, or for a public intellectualism, these new options are just beginning to make themselves felt in the scholarly environment, and Michael believes they could well become very important in the years ahead, especially when paired with ORCID and other standards-based authority metric tools. In keeping with Tuesday’s closing plenary theme on the importance of happiness in the workplace, Bill, Michael, and Susan made sure to take time for some leisurely activities as well. Michael shared with me, “There were two evenings of making music. We had guitars, a baritone ukulele, a violin, and many voices joining in. Smartphones often provided the lyrics, and sometimes the chords if necessary, for Beatles, Dylan, CCR, Woody Guthrie, Pete Seeger, and plenty of others.” Susan made sure to see Austin’s famous emergence of the million-plus Mexican Free-tailed bats from the Congress Avenue Bridge (a.k.a. Ann W. Richards Bridge) at dusk. In her words, “It was quite literally awesome. The bridge was about a block from the hotel, and the bats started coming out at about 9:45 in the evening. Not only do you see them swarming out, but as they fan out over the river, you can see clouds of them off in the distance as they go off to feed on Austin’s insects.” Bill enjoyed some of Austin’s famous ‘cue, and banished any calories thinking about sticking around by taking part in the 5K morning run organized by AAUP. With AAUP a wrap, we’re taking the summer off from conferences, but will be hitting the road again this September. In the meantime, Bill, Susan, Michael, and the rest of our staff will be keeping busy ensuring the projects we are working on for our clients are progressing smoothly. Be sure to check back here periodically, where I’ll be posting topical content, and head over to our Events page to see where Westchester plans to be next.